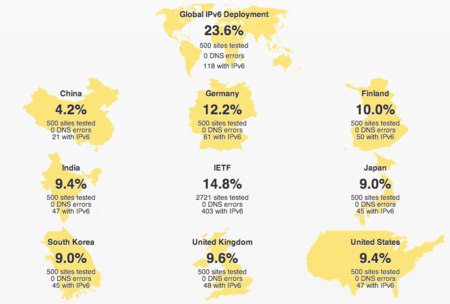 IPv6統計データ - Nothing ventured, nothing gained. If an average user had a working installation of IPv6 on their machine, how useful would it be to them? What percentage of the services and sites the average user regularly accesses are IPv6-enabled? In other words, the experiment attempts to quantify the usefulness of IPv6 to the average end user, given the current deployment of IPv6 in the Internet.